This article is about Hindu texts. For other uses, see Purana (disambiguation). The word Puranas (Sanskrit: पुराण, purāṇa, /pʊˈrɑːnəz/;) literally means "ancient, old", and it is a vast genre of Indian literature about a wide range of topics, particularly myths, legends and other traditional lore. Composed primarily in Sanskrit, but also in regional languages, several of these texts are named after major Hindu deities such as Vishnu, Shiva and Devi. The Puranas genre of literature is found in both Hinduism and Jainism. The Puranic literature is encyclopedic, and it includes diverse topics such as cosmogony, cosmology, genealogies of gods, goddesses, kings, heroes, sages, and demigods, folk tales, pilgrimages, temples, medicine, astronomy, grammar, mineralogy, humor, love stories, as well as theology and philosophy. The content is highly inconsistent across the Puranas, and each Purana has survived in numerous manuscripts which are themselves inconsistent. The Hindu Puranas are anonymous texts and likely the work of many authors over the centuries; in contrast, most Jaina Puranas can be dated and their authors assigned. There are 18 Maha Puranas (Great Puranas) and 18 Upa Puranas (Minor Puranas), with over 400,000 verses. The first versions of the various Puranas were likely composed between the 3rd- and 10th-century CE. The Puranas do not enjoy the authority of a scripture in Hinduism, but are considered a Smriti. They have been influential in the Hindu culture, inspiring major national and regional annual festivals of Hinduism. Their role and value as sectarian religious texts and historical texts has been controversial because all Puranas praise many gods and goddesses and "their sectarianism is far less clear cut" than assumed, states Ludo Rocher. The religious practices included in them are considered Vaidika (congruent with Vedic literature), because they do not preach initiation into Tantra. The Bhagavata Purana has been among the most celebrated and popular text in the Puranic genre, and is of non-dualistic tenor. The Puranic literature wove with the Bhakti movement in India, and both Dvaita and Advaita scholars have commented on the underlying Vedantic themes in the Maha Puranas. Douglas Harper states that the etymological origins of Puranas is from Sanskrit Puranah, literally "ancient, former," from pura "formerly, before," cognate with Greek paros "before," pro "before," Avestan paro "before," Old English fore, from proto-Indo-European *pre-, from root *per-." Vyasa, the narrator of the Mahabharata, is hagiographically credited as the compiler of the Puranas. The date of the production of the written texts does not define the date of origin of the Puranas. They existed in an oral form before being written down, and were incrementally modified well into the 16th century. An early occurrence of the term 'purana' is found in the Chandogya Upanishad (7.1.2), translated by Patrick Olivelle as "the corpus of histories and ancient tales" (The Early Upanisads, 1998, p. 259). The Brhadaranyaka Upanishad refers to purana as the "fifth Veda", itihāsapurāṇaṃ pañcamaṃ vedānāṃ, reflecting the early religious importance of these facts, which over time have been forgotten and presumably then in purely oral form. Importantly, the most famous form of itihāsapurāṇaṃ is the Mahabharata. The term also appears in the Atharvaveda 11.7.24. It is important to bear in mind that perhaps a thousand years separates the occurrence of this term in these Upanisads from 'The Puranas' understood as a unified set of texts (see below), and it is therefore by no means certain that the term as it occurs in the Upanisads has any direct relation to what today is identified as 'The Puranas'. The extant Puranas, states Coburn, are not identical to the original Puranas. Rajendra Hazra notes that Puranas that survive presently do not follow, partially or totally, the characteristic definition of the scope and contents of Puranas as described in ancient non-Puranic Indian texts. In the 19th century, F. E. Pargiter believed the "original Purana" may date to the time of the final redaction of the Vedas. Gavin Flood connects the rise of the written Purana historically with the rise of devotional cults centring upon a particular deity in the Gupta era: the Puranic corpus is a complex body of materials that advance the views of various competing cults. Wendy Doniger, based on her study of indologists, assigns approximate dates to the various Puranas. She dates Markandeya Purana to c. 250 CE (with one portion dated to c. 550 CE), Matsya Purana to c. 250–500 CE, Vayu Purana to c. 350 CE, Harivamsa and Vishnu Purana to c. 450 CE, Brahmanda Purana to c. 350–950 CE, Vamana Purana to c. 450–900 CE, Kurma Purana to c. 550–850 CE, and Linga Purana to c. 600–1000 CE. Of the many texts designated 'Puranas' the most important are the Mahāpurāṇas or the major Puranas. These are said to be eighteen in number, divided into three groups of six, though they are not always counted in the same way. 1 Agni 15,400 verses Contains encyclopedic information. Includes geography of Mithila (Bihar and neighboring states), cultural history, politics, education system, iconography, taxation theories, organization of army, theories on proper causes for war, diplomacy, local laws, building public projects, water distribution methods, trees and plants, medicine, Vastu Shastra (architecture), gemology, grammar, metrics, poetry, food, rituals and numerous other topics. 2 Bhagavata 18,000 verses The most studied and popular of the Puranas, telling of Vishnu's Avatars, and of Vaishnavism. It contains a controversial genealogical details of various dynasties. Numerous inconsistent versions of this text and historical manuscripts exist, in many Indian languages. Influential and elaborated during Bhakti movement. 3 Brahma 10,000 verses Sometimes also called Adi Purana, because many Mahapuranas lists put it first of 18. The text has 245 chapters, shares many passages with Vishnu, Vayu, Markendeya Puranas, and with the Mahabharata. Includes mythology, theory of war, art work in temples, and other cultural topics. Describes holy places in Odisha, and weaves themes of Vishnu and Shiva, but hardly any mention of deity Brahma despite the title. 4 Brahmanda 12,000 verses One of the earliest composed Puranas, it contains a controversial genealogical details of various dynasties. Includes Lalita Sahasranamam, law codes, system of governance, administration, diplomacy, trade, ethics. Old manuscripts of Brahmanda Purana have been found in the Hindu literature collections of Bali, Indonesia. 5 Brahmavaivarta 17,000 verses Discusses Shiva, Parvati, Ganesha, Devis, Vishnu, Krishna and Radha. Primarily mythology, love and seduction stories of gods and goddesses. Mentions geography and rivers such as Ganga to Kaveri. 6 Garuda 19,000 verses An encyclopedia of diverse topics. Primarily about Vishnu, but praises all gods. Describes how Vishnu, Shiva and Brahma collaborate. Many chapters are a dialogue between Vishnu and the bird-vehicle Garuda. Cosmology, Describes cosmology, relationship between gods. Discusses ethics, what are crimes, good verses evil, various schools of Hindu philosophies, the theory of Yoga, the theory of "heaven and hell" with "karma and rebirth", includes Upanishadic discussion of self-knowledge as a means of moksha. Includes chapters on rivers, geography of Bharat (India) and other nations on earth, types of minerals and stones, testing methods for stones for their quality, various diseases and their symptoms, various medicines, aphrodisiacs, prophylactics, Hindu calendar and its basis, astronomy, moon, planets, astrology, architecture, building home, essential features of a temple, rites of passage, virtues such as compassion, charity and gift making, economy, thrift, duties of a king, politics, state officials and their roles and how to appointment them, genre of literature, rules of grammar, and other topics. The final chapters discuss how to practice Yoga (Samkhya and Advaita types), personal development and the benefits of self-knowledge. 7 Kurma 17,000 verses Is the second of ten major avatars of Lord Vishnu. 8 Linga 11,000 verses Discusses Lingam, symbol of Shiva, and origin of the universe. It also contains many stories of Lingam, one of which entails how Agni Lingam solved a dispute between Vishnu and Brahma. 9 Markandeya 9,000 verses Describes Vindhya Range and western India. Probably composed in the valleys of Narmada and Tapti rivers, in Maharashtra and Gujarat. Named after sage Markandeya, a student of Brahma. Contains chapters on dharma and on Hindu epic Mahabharata. The Purana includes Devi Mahatmyam of Shaktism. 10 Matsya 14,000 verses An encyclopedia of diverse topics. Narrates the story of Matsya, the first of ten major Avatars of Vishnu. Likely composed in west India, by people aware of geographical details of the Narmada river. Includes legends about Brahma and Saraswati. It also contains a controversial genealogical details of various dynasties. 11 Narada 25,000 verses Also called Naradiya Purana. Discusses the four Vedas and the six Vedangas. Dedicates one chapter each, from Chapters 92 to 109, to summarize the other 17 Maha Puranas and itself. Lists major rivers of India and places of pilgrimage, and a short tour guide for each. Includes discussion of various philosophies, soteriology, planets, astronomy, myths and characteristics of major deities including Vishnu, Shiva, Devi, Krishna, Rama, Lakshmi and others. 12 Padma 55,000 verses A large compilation of diverse topics. The north Indian manuscripts of Padma Purana are very different than south Indian versions, and the various recensions in both groups in different languages (Devanagari and Bengali, for example) show major inconsistencies. Describes cosmology, the world and nature of life from the perspective of Vishnu. Discusses festivals, numerous legends, geography of rivers and regions from northwest India to Bengal to the kingdom of Tripura, major sages of India, various Avatars of Vishnu and his cooperation with Shiva, the story of Rama-Sita that is different than the Hindu epic Ramayana. Like Skanda Purana, it is a detailed treatise on travel and pilgrimage centers in India. 13 Shiva 24,000 verses Discusses Shiva, and stories about him. 14 Skanda 81,100 verses Describes the birth of Skanda (or Karthikeya), son of Shiva. The longest Purana, it is an extraordinarily meticulous pilgrimage guide, containing geographical locations of pilgrimage centers in India, with related legends, parables, hymns and stories. Many untraced quotes are attributed to this text. 15 Vamana 10,000 verses Describes North India, particularly Himalayan foothills region. 16 Varaha 24,000 verses Primarily Vishnu-related worship manual, with large Mahatmya sections or travel guide to Mathura and Nepal. Presentation focuses on Varaha as incarnation of Narayana, but rarely uses the terms Krishna or Vasudeva. Many illustrations also involve Shiva and Durga. 17 Vayu 24,000 verses Possibly the oldest of all Maha Puranas. Some medieval Indian texts call it Vayaviya Purana. Mentioned and studied by Al Biruni, the 11th century Persian visitor to India. Praises Shiva. Discusses rituals, family life, and life stages of a human being. The content in Vayu Purana is also found in Markandeya Purana. Describes south India, particularly modern Telangana and Andhra Pradesh regions. It contains a controversial genealogical details of various dynasties. 18 Vishnu 23,000 verses One of the most studied and circulated Puranas, it also contains a controversial genealogical details of various dynasties. Better preserved after the 17th century, but exists in inconsistent versions, more ancient pre-15th century versions are very different from modern versions, with some versions discussing Buddhism and Jainism. Some chapters likely composed in Kashmir and Punjab region of South Asia. A Vaishnavism text, focussed on Vishnu. The Padma Purana, Uttara Khanda (236.18-21), itself a Vaishnava Purana, classifies the Puranas in accordance with the three gunas or qualities; truth, passion, and ignorance. All major Puranas contain sections on Devi (goddesses) and Tantra, but of these the six most significant ones are: Markandeya Purana, Shiva Purana, Linga Purana, Brahma Vaivarta Purana, Agni Purana and Padma Purana. The difference between Upapuranas and Mahapuranas has been explained by Rajendra Hazra as, "a Mahapurana is well known, and that what is less well known becomes an Upapurana". Rocher states that the distinction between Mahapurana and Upapurana is ahistorical, there is little corroborating evidence that either were more or less known, and that "the term Mahapurana occurs rarely in Purana literature, and is probably of late origin." The Upapuranas are eighteen in number, with disagreement as to which canonical titles belong in that list of eighteen. They include among many: Sanat-kumara, Narasimha, Brihan-naradiya, Siva-rahasya, Durvasa, Kapila, Vamana, Bhargava, Varuna, Kalika, Samba, Nandi, Surya, Parasara, Vasishtha, Devi-Bhagavata, Ganesha, Mudgala, and Hamsa, with only a few having been critically edited. The Ganesha and Mudgala Puranas are devoted to Ganesha. The Devi-Bhagavata Purana, which extols the goddess Durga, has become (along with the Devi Mahatmya of the Markandeya Purana) a basic text for Devi worshipers. This corpus of texts tells of the origins and traditions of particular Tamil Shiva temples or shrines. There are numerous Sthala Puranas, most written in vernaculars, some with Sanskrit versions as well. The 275 Shiva Sthalams of the continent have puranas for each, famously glorified in the Tamil literature Tevaram. Some appear in Sanskrit versions in the Mahapuranas or Upapuranas. Some Tamil Sthala Puranas have been researched by David Dean Shulman. Vishnu is nobody but Shiva, and he who is called Shiva is but identical with Vishnu. The Skanda Purana has received renewed scholarly interest ever since the late 20th-century discovery of a Nepalese Skanda Purana manuscript dated to be from the early 9th century. This discovery established that Skanda Purana existed by the 9th century. However, a comparison shows that the 9th-century document is entirely different than versions of Skanda Purana that have been circulating in South Asia since the colonial era. 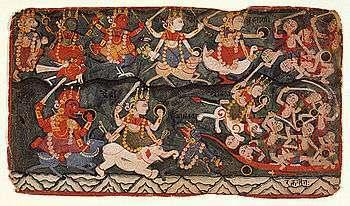 The Puranas include cosmos creation myths such as the Samudra Manthan (churning of the ocean). These ideas spread to southeast Asia. 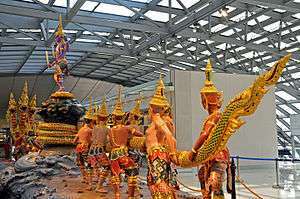 It is represented in the Angkor Wat temple complex of Cambodia, and at Bangkok airport, Thailand (above). Vamśānucaritam: legends during the times of various kings. These five or ten sections weave in biographies, myths, geography, medicine, astronomy, Hindu temples, pilgrimage to distant real places, rites of passage, charity, ethics, duties, rights, dharma, divine intervention in cosmic and human affairs, love stories, festivals, theosophy and philosophy. The Puranas link gods to men, both generally and in religious bhakti context. Here the Puranic literature follows a general pattern. It starts with introduction, a future devotee is described as ignorant about the god yet curious, the devotee learns about the god and this begins the spiritual realization, the text then describes instances of god's grace which begins to persuade and convert the devotee, the devotee then shows devotion which is rewarded by the god, the reward is appreciated by the devotee and in return performs actions to express further devotion. Over time, states Om Prakash, chapters and verses from one Purana were transferred or interpolated into another Purana. Similarly, texts from Vedic literature, Smritis and Sutras were incorporated into the Puranas, older verses were replaced with new ones, thereby creating manuscripts with the same name but inconsistent content. The content about kings, history of various people, sages and kingdoms are in part based on real events, in part hagiography, and in part expansive imagination or fabrication. The high degree of inconsistency and manuscript corruption occurred particularly from the 12th century onwards, evidenced by cross referencing across the texts; Matsya Purana, for example, stated that Kurma Purana has 18,000 verses, while Agni Purana asserts the same text has 8,000 verses, and Naradiya attests that Kurma manuscript has 17,000 verses. Along with inconsistencies, common ideas are found throughout the corpus but it is not possible to trace the lines of influence of one Purana upon another so the corpus is best viewed as a synchronous whole. An example of similar myths woven across the Puranas, but in different versions, include the lingabhava – the "apparition of the linga". The story features Brahma, Vishnu and Shiva, the three major deities of Hinduism, who get together, debate, and after various versions of the story, in the end the glory of Shiva is established by the apparition of linga. 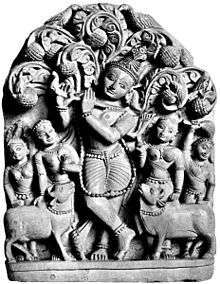 This myth, state Bonnefoy and Doniger, appears in Vayu Purana 1.55, Brahmanda Purana 1.26, Shiva Purana's Rudra Samhita Sristi Khanda 15, Skanda Purana's chapters 1.3, 1.16 and 3.1, and other Puranas. The texts are in Sanskrit as well as regional languages, and almost entirely in narrative metric couplets. The progeny of Dharma by the daughters of Daksha were as follows: by Sraddhá (devotion) he had Kama (desire); by Lakshmí (wealth, prosperity), was born Darpa (pride); by Dhriti (courage), the progeny was Niyama (precept); by Tusht́i (inner comfort), Santosha (contentment); by Pusht́i (opulence), the progeny was Lobha (cupidity, greed); by Medhá (wisdom, experience), Sruta (sacred tradition); by Kriyá (hard work, labour), the progeny were Dańd́a, Naya, and Vinaya (justice, politics, and education); by Buddhi (intellect), Bodha (understanding); by Lajjá (shame, humility), Vinaya (good behaviour); by Vapu (body, strength), Vyavasaya (perseverance). Shanti (peace) gave birth to Kshama (forgiveness); Siddhi (excellence) to Sukha (enjoyment); and Kírtti (glorious speech) gave birth to Yasha (reputation). These were the sons of Dharma; one of whom, Kama (love, emotional fulfillment) had baby Hersha (joy) by his wife Nandi (delight). The wife of Adharma (vice, wrong, evil) was Hinsá (violence), on whom he begot a son Anrita (falsehood), and a daughter Nikriti (immorality): they intermarried, and had two sons, Bhaya (fear) and Naraka (hell); and twins to them, two daughters, Máyá (deceit) and Vedaná (torture), who became their wives. The son of Bhaya (fear) and Máyá (deceit) was the destroyer of living creatures, or Mrityu (death); and Dukha (pain) was the offspring of Naraka (hell) and Vedaná (torture). The children of Mrityu were Vyádhi (disease), Jará (decay), Soka (sorrow), Trishńa (greediness), and Krodha (wrath). These are all called the inflictors of misery, and are characterised as the progeny of Vice (Adharma). They are all without wives, without posterity, without the faculty to procreate; they perpetually operate as causes of the destruction of this world. On the contrary, Daksha and the other Rishis, the elders of mankind, tend perpetually to influence its renovation: whilst the Manus and their sons, the heroes endowed with mighty power, and treading in the path of truth, as constantly contribute to its preservation. The Puranic literature, stated Max Muller, is independent, has changed often over its history, and has little relation to the Vedic age or the Vedic literature. Some scholars suggest that the Puranas claim a link to the Vedas but in name only, not in substance. Yet a third group of scholars state that the link is there, at least in spiritual themes and theology. The Puranas aim to complement the Vedic literature, interpret its theories, and help spread the ideas therein. The Puranas, states Kees Bolle, are best seen as "vast, often encyclopedic" works from ancient and medieval India. Some of them, such as the Agni Purana and Matsya Purana, cover all sorts of subjects, dealing with – states Rocher – "anything and everything", from fiction to facts, from practical recipes to abstract philosophy, from geographic Mahatmyas (travel guides) to cosmetics, from festivals to astronomy. Like encyclopedias, they were updated to remain current with their times, by a process called Upabrimhana. However, some of the 36 major and minor Puranas are more focussed handbooks, such as the Skanda Purana, Padma Purana and Bhavishya Purana which deal primarily with Tirtha Mahatmyas (pilgrimage travel guides), while Vayu Purana and Brahmanda Purana focus more on history, mythology and legends. The colonial era scholars of Puranas studied them primarily as religious texts, with Vans Kennedy declaring in 1837, that any other use of these documents would be disappointing. John Zephaniah Holwell, who from 1732 onwards spent 30 years in India and was elected Fellow of the Royal Society in 1767, described the Puranas as "18 books of divine words". British officials and researchers such as Holwell, states Urs App, were orientalist scholars who introduced a distorted picture of Indian literature and Puranas as "sacred scriptures of India" in 1767. Holwell, states Urs App, "presented it as the opinion of knowledgeable Indians; But it is abundantly clear that no knowledgeable Indian would ever have said anything remotely similar". I want to stress the fact that it would be irresponsible and highly misleading to speak of or pretend to describe the religion of the Puranas. The study of Puranas as a religious text remains a controversial subject. Some Indologists, in colonial tradition of scholarship, treat the Puranic texts as scriptures or useful source of religious contents. Other scholars, such as Ronald Inden, consider this approach "essentialist and antihistorical" because the Purana texts changed often over time and over distance, and the underlying presumption of they being religious texts is that those changes are "Hinduism expressed by a religious leader or philosopher", or "expressiveness of Hindu mind", or "society at large", when the texts and passages are literary works and "individual geniuses of their authors". The Jaina Puranas are like Hindu Puranas encyclopedic epics in style, and are considered as anuyogas (expositions), but they are not considered Jain Agamas and do not have scripture or quasi-canonical status in Jainism tradition. They are best described, states John Cort, as post-scripture literary corpus based upon themes found in Jain scriptures. Scholars have debated whether the Puranas should be categorized as sectarian, or non-partisan, or monotheistic religious texts. Different Puranas describe a number of stories where Brahma, VIshnu and Shiva compete for supremacy. In some Puranas, such as Devi Bhagavata, the Goddess Devi joins the competition and ascends for the position of being Supreme. Further, most Puranas emphasize legends around one who is either Shiva, or Vishnu, or Devi. The texts thus appear to be sectarian. However, states Edwin Bryant, while these legends sometimes appear to be partisan, they are merely acknowledging the obvious question of whether one or the other is more important, more powerful. 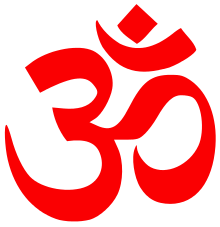 In the final analysis, all Puranas weave their legends to celebrate pluralism, and accept the other two and all gods in Hindu pantheon as personalized form but equivalent essence of the Ultimate Reality called Brahman. The Puranas are not spiritually partisan, states Bryant, but "accept and indeed extol the transcendent and absolute nature of the other, and of the Goddess Devi too". [The Puranic text] merely affirm that the other deity is to be considered a derivative manifestation of their respective deity, or in the case of Devi, the Shakti, or power of the male divinity. The term monotheism, if applied to the Puranic tradition, needs to be understood in the context of a supreme being, whether understood as Vishnu, Shiva or Devi, who can manifest himself or herself as other supreme beings. Ludo Rocher, in his review of Puranas as sectarian texts, states, "even though the Puranas contain sectarian materials, their sectarianism should not be interpreted as exclusivism in favor of one god to the detriment of all others". Despite the diversity and wealth of manuscripts from ancient and medieval India that have survived into the modern times, there is a paucity of historical data in them. Neither the author name nor the year of their composition were recorded or preserved, over the centuries, as the documents were copied from one generation to another. This paucity tempted 19th-century scholars to use the Puranas as a source of chronological and historical information about India or Hinduism. This effort was, after some effort, either summarily rejected by some scholars, or become controversial, because the Puranas include fables and fiction, and the information within and across the Puranas was found to be inconsistent. In early 20th-century, some regional records were found to be more consistent, such as for the Hindu dynasties in Telangana, Andhra Pradesh. Basham, as well as Kosambi have questioned whether lack of inconsistency is sufficient proof of reliability and historicity. More recent scholarship has attempted to, with limited success, states Ludo Rocher, use the Puranas for historical information in combination with independent corroborating evidence, such as "epigraphy, archaeology, Buddhist literature, Jaina literature, non-Puranic literature, Islamic records, and records preserved outside India by travelers to or from India in medieval times such as in China, Myanmar and Indonesia". The study of Puranas manuscripts has been challenging because they are highly inconsistent. This is true for all Mahapuranas and Upapuranas. Most editions of Puranas, in use particularly by Western scholars, are "based on one manuscript or on a few manuscripts selected at random", even though divergent manuscripts with the same title exist. Scholars have long acknowledged the existence of Purana manuscripts that "seem to differ much from printed edition", and it is unclear which one is accurate, and whether conclusions drawn from the randomly or cherrypicked printed version were universal over geography or time. This problem is most severe with Purana manuscripts of the same title, but in regional languages such as Tamil, Telugu, Bengali and others which have largely been ignored. Modern scholarship noticed all these facts. It recognized that the extent of the genuine Agni Purana was not the same at all times and in all places, and that it varied with the difference in time and locality. (...) This shows that the text of the Devi Purana was not the same everywhere but differed considerably in different provinces. Yet, one failed to draw the logical conclusion: besides the version or versions of puranas that appear in our [surviving] manuscripts, and fewer still in our [printed] editions, there have been numerous other versions, under the same titles, but which either have remained unnoticed or have been irreparably lost. Newly discovered Puranas manuscripts from the medieval centuries has attracted scholarly attention and the conclusion that the Puranic literature has gone through slow redaction and text corruption over time, as well as sudden deletion of numerous chapters and its replacement with new content to an extent that the currently circulating Puranas are entirely different than those that existed before 11th century, or 16th century. For example, a newly discovered palm-leaf manuscript of Skanda Purana in Nepal has been dated to be from 810 CE, but is entirely different than versions of Skanda Purana that have been circulating in South Asia since the colonial era. Further discoveries of four more manuscripts, each different, suggest that document has gone through major redactions twice, first likely before the 12th century, and the second very large change sometime in the 15th-16th century for unknown reasons. The different versions of manuscripts of Skanda Purana suggest that "minor" redactions, interpolations and corruption of the ideas in the text over time. 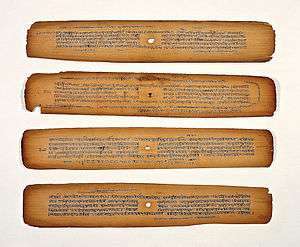 Many of the extant manuscripts were written on palm leaf or copied during the British India colonial era, some in the 19th-century. The scholarship on various Puranas, has suffered from frequent forgeries, states Ludo Rocher, where liberties in the transmission of Puranas were normal and those who copied older manuscripts replaced words or added new content to fit the theory that the colonial scholars were keen on publishing. Horace Hayman Wilson published one of the earliest English translations of one version of the Vishnu Purana in 1840. The same manuscript, and Wilson's translation, was reinterpreted by Manmatha Nath Dutt, and published in 1896. The All India Kashiraj Trust has published editions of the Puranas. Maridas Poullé (Mariyadas Pillai) published a French translation from a Tamil version of the Bhagavata Purana in 1788, and this was widely distributed in Europe becoming an introduction to the 18th-century Hindu culture and Hinduism to many Europeans during the colonial era. Poullé republished a different translation of the same text as Le Bhagavata in 1795, from Pondicherry. A copy of Poullé translation is preserved in Bibliothèque nationale de France, Paris. The Puranas have had a large cultural impact on Hindus, from festivals to diverse arts. Bharata natyam (above) is inspired in part by Bhagavata Purana. 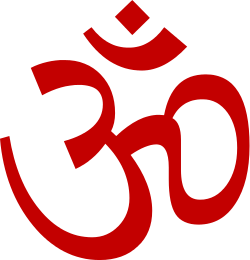 The most significant influence of the Puranas genre of Indian literature have been, state scholars and particularly Indian scholars, in "culture synthesis", in weaving and integrating the diverse beliefs from ritualistic rites of passage to Vedantic philosophy, from fictional legends to factual history, from individual introspective yoga to social celebratory festivals, from temples to pilgrimage, from one god to another, from goddesses to tantra, from the old to the new. These have been dynamic open texts, composed socially, over time. This, states Greg Bailey, may have allowed the Hindu culture to "preserve the old while constantly coming to terms with the new", and "if they are anything, they are records of cultural adaptation and transformation" over the last 2,000 years. The Puranic literature, suggests Khanna, influenced "acculturation and accommodation" of a diversity of people, with different languages and from different economic classes, across different kingdoms and traditions, catalyzing the syncretic "cultural mosaic of Hinduism". They helped influence cultural pluralism in India, and are a literary record thereof. Om Prakash states the Puranas served as efficient medium for cultural exchange and popular education in ancient and medieval India. These texts adopted, explained and integrated regional deities such as Pashupata in Vayu Purana, Sattva in Vishnu Purana, Dattatreya in Markendeya Purana, Bhojakas in Bhavishya Purana. Further, states Prakash, they dedicated chapters to "secular subjects such as poetics, dramaturgy, grammar, lexicography, astronomy, war, politics, architecture, geography and medicine as in Agni Purana, perfumery and lapidary arts in Garuda Purana, painting, sculpture and other arts in Vishnudharmottara Purana". The cultural influence of the Puranas extended to Indian classical arts, such as songs, dance culture such as Bharata Natyam in south India and Rasa Lila in northeast India, plays and recitations. The myths, lunar calendar schedule, rituals and celebrations of major Hindu cultural festivities such as Holi, Diwali and Durga Puja are in the Puranic literature. ↑ This text underwent a near complete rewrite in or after 15th/16th century CE, and almost all extant manuscripts are Vaishnava (Krishna) bhakti oriented. ↑ Like all Puranas, this text underwent extensive revisions and rewrite in its history; the extant manuscripts are predominantly an encyclopedia, and so secular in its discussions of gods and goddesses that scholars have classified as Smartism, Shaktism, Vaishnavism and Shaivism Purana. 1 2 3 4 This text is named after a Vishnu avatar, but extant manuscripts praise all gods and goddesses equally with some versions focusing more on Shiva. 1 2 Hazra includes this in Vaishnava category. ↑ This text includes the famous Devi-Mahatmya, one of the most important Goddess-related text of the Shaktism tradition in Hinduism. 1 2 3 Scholars consider the Sattva-Rajas-Tamas classification as "entirely fanciful" and there is nothing in each text that actually justifies this classification. ↑ Nair, Shantha N. (2008). Echoes of Ancient Indian Wisdom: The Universal Hindu Vision and Its Edifice. Hindology Books. p. 266. ISBN 978-81-223-1020-7. 1 2 Collins, Charles Dillard (1988). The Iconography and Ritual of Śiva at Elephanta. SUNY Press. p. 36. ISBN 978-0-88706-773-0. 1 2 Thompson, Richard L. (2007). The Cosmology of the Bhagavata Purana 'Mysteries of the Sacred Universe. Motilal Banarsidass Publishers. p. 10. ISBN 978-81-208-1919-1. 1 2 Pargiter 1962, pp. 30–54. ↑ R. C. Hazra, Studies in the Upapuranas, vol. I, Calcutta, Sanskrit College, 1958. Studies in the Upapuranas, vol. II, Calcutta, Sanskrit College, 1979. Studies in Puranic Records on Hindu Rites and Customs, Delhi, Banarsidass, 1975. Ludo Rocher, The Puranas - A History of Indian Literature Vol. II, fasc. 3, Wiesbaden: Otto Harrassowitz, 1986. ↑ Vayu Purana 1. 31-2. 1 2 Ariel Glucklich 2008, p. 146, Quote: The earliest promotional works aimed at tourists from that era were called mahatmyas. ↑ Ludo Rocher (1986), The Puranas, Otto Harrassowitz Verlag, ISBN 978-3447025225, pages 1-5, 12-21, 79-80, 96-98; Quote: These are the true encyclopedic Puranas. in which detached chapters or sections, dealing with any imaginable subject, follow one another, without connection or transition. Three Puranas especially belong to this category: Matsya, Garuda and above all Agni. ↑ Rocher 1986, p. 249. ↑ Gregory Bailey 2003, pp. 139-141, 154-156. 1 2 Dimmitt & van Buitenen 2012, p. 5. 1 2 Rocher 1986, pp. 49-53. 1 2 Avril Ann Powell (2010). Scottish Orientalists and India: The Muir Brothers, Religion, Education and Empire. Boydell & Brewer. pp. 130, 128–134, 87–90. ISBN 978-1-84383-579-0. Gregory Bailey (2003). Arvind Sharma, ed. The Study of Hinduism (Chapter: The Puranas). University of South Carolina Press. ISBN 978-1-57003-449-7. Doniger, Wendy (editor) (1993). Purāṇa Perennis: Reciprocity and Transformation in Hindu and Jaina Texts. Albany, New York: State University of New York. ISBN 0-7914-1382-9. Hardy, Friedhelm (2001). Viraha-Bhakti - The Early History of Krsna Devotion in South India. ISBN 0-19-564916-8. Flood, Gavin (1996). An Introduction to Hinduism. Cambridge University Press. ISBN 0-521-43304-5. Kaushal, Molly (editor) (2001). Chanted Narratives - The Katha Vachana Tradition. ISBN 81-246-0182-8. Mackenzie, C Brown (1990). The Triumph of the Goddess - The Canonical Models and Theological Visions of the DevI-BhAgavata PuraNa. State University of New York Press. ISBN 0-7914-0363-7. Mittal, Sushil (2004). The Hindu World. Routledge. ISBN 978-0-415-21527-5. Moghe, S. G. (editor) (1997). Professor Kane's contribution to Dharmasastra literature. New Delhi: D.K. Printworld (P) Ltd. ISBN 81-246-0075-9. Monier-Williams, Monier (1899). A Sanskrit-English Dictionary. Oxford University Press. Pargiter, F. E. (1962) . Ancient Indian historical tradition. Original publisher Oxford University Press, London. Delhi: Motilal Banarasidass. OCLC 1068416. Shulman, David Dean (1980). Tamil Temple Myths: Sacrifice and Divine Marriage in the South Indian Saiva Tradition. ISBN 0-691-06415-6. Singh, Nagendra Kumar (1997). Encyclopaedia of Hinduism. ISBN 81-7488-168-9. Thapan, Anita Raina (1997). Understanding Gaṇapati: Insights into the Dynamics of a Cult. New Delhi: Manohar Publishers. ISBN 81-7304-195-4.